Samsung is hosting an event in Barcelona later this month, where the company is expected to debut the Galaxy S5. Samsung may officially unveil the Galaxy S5 before the end of the month. 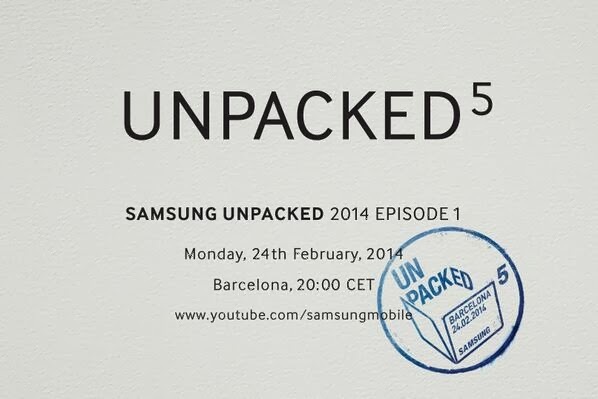 Today the company tweeted an invitation for the first episode of its Unpacked 5 event, which will be held on February 24th, the first day of the Mobile World Congress in Barcelona. Samsung regularly uses its Unpacked events to announce new hardware. Not much is known about Samsung's next flagship smartphone, although it is expected to be more physically unique than the Galaxy S4, which closely resembles its predecessor from 2012. "When we moved to S4 from S3, it’s partly true that consumers couldn’t really feel much difference between the two products from the physical perspective, so the market reaction wasn’t as big," said Lee Young Hee, a Samsung executive, when speaking with Bloomberg earlier this year. "For the S5, we will go back to the basics. Mostly, it’s about the display and the feel of the cover." A new version of the Galaxy Gear smartwatch is expected to be announced at around the same time as the Galaxy S5 reveal.